CHRISTOPHER WREN (1632-1723) Sir Christopher Wren is one of the most highly acclaimed English architects in history. He was accorded responsibility for rebuilding 52 churches in the City of London after the Great Fire in 1666, including what is regarded as his masterpiece, St. Paul's Cathedral, on Ludgate Hill, completed in 1710. ROBERT ADAM (1728-1792) JAMES ADAM (1732-1794) The Adams brothers business started in London, focusing on designing complete schemes for the decoration and furnishing of houses. Palladian design was popular, but Robert had evolved a new, more flexible style incorporating elements of classic Roman design alongside influences from Greek, Byzantine and Baroque styles. The Adam brothers’ success can also be attributed to a desire to design everything down to the smallest detail, ensuring a sense of unity in their designs. PATRICK SYME (1774–1845) was a Scottish artist born in 1774. He is best known for his book entitled Werner’s Nomenclature of Colours, in which he attempted to provide standard colour names, descriptions, and actual colour samples for artists and naturalists. Adapted from wallpaper from the M.H. Birge & Sons Company, Buffalo, New York, circa 1911. 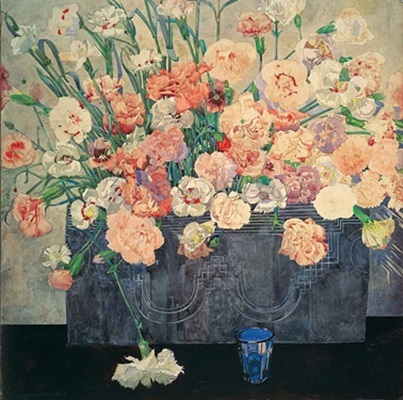 From the collection of the Burchfield-Penney Art Center, Buffalo State College, New York. 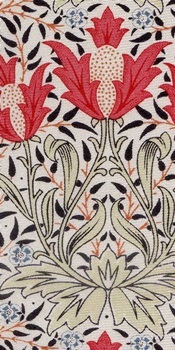 WILLIAM MORRIS (1834 – 1896) was an English textile designer, poet, novelist, translator, and socialist activist. Associated with the British Arts and Crafts Movement, he was a major contributor to the revival of traditional British textile arts and methods of production. WILLIAM De MORGAN (1839-1917) was an English potter, tile designer, novelist, and the most important ceramic artist of the Arts and Crafts Movement. 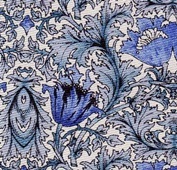 A lifelong friend of William Morris, he designed tiles, stained glass and furniture for Morris & Co. from 1863 to 1872. EUGENE GROSSET (1845 – 1917) was born in Switzerland and moved to Paris in 1871 where he designed furniture, fabrics and tapestries as well as ceramics and jewelry. Later becoming known for his graphic design and posters, creating notable art nouveau motifs and patterns. CHARLES VOYSEY (1857-1941) was an architect and designer of all forms of decorative art. 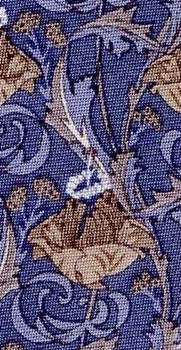 He was influenced by the work of William Morris, the Arts and Crafts Movement and Art Nouveau. Voysey designed houses, furniture, repeat patterns for wallpaper, woven and printed textiles and carpets. ALPHIONSE MUCHA ((1860 - 1939) This Czech artist's inimitable art nouveau style found fame in Paris in the late 19th century. He produced many paintings, posters, book illustrations, advertisements, as well as designs for jewellery, carpets, wallpaper, and theatre sets. 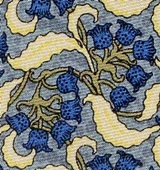 LINDSAY BUTTERFIELD (1869-1948) was one of the most successful freelance British textile and wallpaper designers at the turn of the twentieth century. 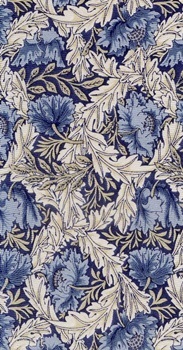 Much of his design work was floral based, following in the footsteps of William Morris. He also admired Charles Voysey, a contemporary of his. Butterfield took Arts & Crafts ideas into Art Nouveau. ANTONI GAUDI - 1852-1926 - Spain's most famous architect, was the leading exponent of Modernism, the Catalonian version of Art Nouveau. His highly sculptural creations, such as Barcelona's Casa Mila, Guell Park and the unfinished Sagrada Familia Cathedral are celebrated internationally as works of genius. From window designs in the Guell Colony Crypt, Santa Coloma de Cervello (1898-1917). From bench designs in Guell Park, Barcelona (1900-1914). CHARLES RENNIE MACKINTOSH (1868-1928) holds a special place in the history of architecture and design. He is best known as the architect of the Glasgow School of Art (built 1897-1909), the Willow Team Rooms, and Hill House - all masterpieces of visual symbolism, historic reference, poetic intensity, and pure geometry. One of Mackintosh's fundamental beliefs was that art, architecture, and the crafts were one creative whole. His buildings are inseparable from what they contain, every element, however minute, is considered in relation to the whole. MARGARET MACDONALD - 1865 - 1933 provided the decorative arts to Charles' buildings. The result is a unique vocabulary of design and decoration that can only be described as "Mackintosh". 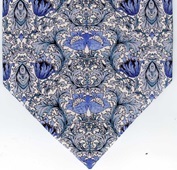 A portion of the proceeds of the sale of these ties goes to assist the conservation and education programs of the Hunterian Museum & Art Gallery, University of Glasgow. 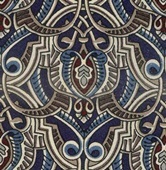 Adapted from the textile design "Rose and Teardrop" (1915-23). 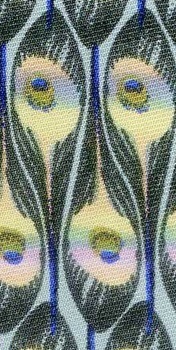 Based on the textile design, "Wave Pattern" (1915-23). Based on stained glass panels that mark entrance ways throughout the Glasgow School of Art. LOUIS COMFORT TIFFANY (1848 – 1933) was an American artist who worked in the decorative arts and is best known for his art nouveau designs in stained glass. BAUHAUS - JOOST SCHMIDT - (1893 - 1948) Joost Schmidt was a typographer and sculptor. In 1910, he began studying at the Grand-Ducal Saxon Academy of fine Art in Weimar. A student at the Bauhaus from 1919 to 1925, he trained in the wood-carving workshop. His first typographical works date from 1923. Schmidt taught at the Bauhaus from 1925 to 1932. There he was head of the sculpture workshop from 1925 to 1930 and head of the advertising department from 1928. He taught the Lettering course plus life drawing. Schmidt also rented a studio in Berlin and worked as a cartographer in a publishing house. Based on a heating panel for the Sommerfeld House in Berlin (1921). Copyright 2006 Artists Rights Society (ARS), New York / VG Bild-Kunst, Bonn. ART DECO - was the highly colorful and playful geometric style which ruled the Paris Salons in the immediate post-WWI years – the chevrons, arcs, sunbursts, maidens, fountains, floral abstractions and ubiquitous biche (doe) – and also the crisp angular patterns, most with American modernistic impulses, including zig-zag, jazz-age, machine-age, and streamlined aesthetics, to which architects were drawn towards 1930 and to which its supporters believe the Deco label most appropriately applies. Based on a baluster Sullivan designed for the Chicago Stock Exchange Building (1893). Licensed by the Chicago Architecture Foundation. FRANK LLOYD WRIGHT - 1867-1959 is recognized as the 20th century's greatest architect. His buildings as well as his other commissions represent some of the world's most important architectural and design treasures. During his more than 70-year career, Wright created nearly 800 works, including his famous Prairie houses, Usonian buildings, offices and resorts, churches and temples, and finally, an art museum. In his art, Frank Lloyd Wright transformed the materials of nature into forms and spaces idealized by the human mind - creating things nearly divine. Born of the intimate beauty of Wright's decorative details, the Frank Lloyd Wright® Neckwear Collections seek to convey Wright's monumental vision of the human spirit. These Frank Lloyd Wright® Collection products are authorized by the Frank Lloyd Wright Foundation, Taliesin West, Scottsdale, Arizona. 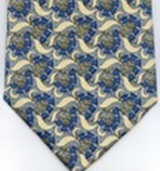 A portion of the sales of these ties supports the conservation and education programs of the foundation. There are so many beautiful Frank Lloyd Wright Neckties that he has his own page. SANTIAGO CALATRAVA - 1951 in Valencia, Spain. As both an architect and an engineer, Calatrava easily identifies with both disciplines. He often creates innovative works that depend on a firm grasp of both the creative and structural aspects of design. His skills as an engineer allow him to create sculptural surfaces and unusual spaces. 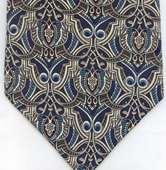 $45.00 silk tie In 2001, a landmark building was completed. The Milwaukee Art Museum addition, the first US building designed by Spanish-born architect, Santiago Calatrava opened to the public. The centerpiece of this creation is a 90-foot high transparent gathering place enclosed by a light-controlling sunscreen, the brise soleil. It can be raised or lowered creating a dramatic sculpture, which the architect likened to a bird in flight. 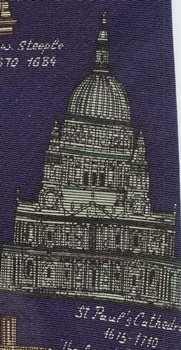 A portion of the sales of these ties supports the education programs of the Milwaukee Art Museum . Brise Soleil = Large Aerofoil Fins that allow a significant level of natural daylight into the building whilst reducing solar gain. Additionally, the wide spacing allows good outward visibility with less clutter to the sight line. Furthermore, they fit in well with the concept of natural ventilation, and provide excellent control of the internal environment if controlled automatically or linked to the Building Management System. 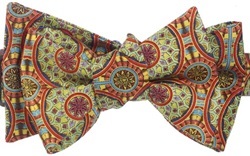 For ties with architectural details and building styles go to the Architecture Neckties page. Frank Lloyd Wrights has his own page of neckties and also some t-shirts. Check out more Art ties on the Renaissance to Impressionism and Modern to Contemporary artist necktie pages. M C Echer and Norman Rockefeller get their own pages and artists from the first civilizations also have their page.